"Love" token, awarded by evilvoland. "Love" token, awarded by franalburquerque. "Party Time" token, awarded by pistoltoto. "Love" token, awarded by philm. "Love" token, awarded by Yanis. "Heartbreak" token, awarded by ogierm. "Pterodactyl" token, awarded by vsautter. "Love" token, awarded by riidom. "Love" token, awarded by esdw22. "Love" token, awarded by Nallic. rB0e3a2acbfa69: Fix T57457: animated image sequences not working in Eevee. T59394: Image sequence as texture not previewed and not rendered. T60255: eevee render - import video as plane "not working"
T58804: Animated textures used in materials are not working correctly in EEVEE. Brecht Van Lommel (brecht) added subscribers: Andre (AJ_vdw), Campbell Barton (campbellbarton), Bastien Montagne (mont29). Marking as high priority since this gets reported often. This is a rather complicated issue caused mainly by copy-on-write changes. Previously on each frame change Blender would loop over (most) image users, recalculate the frame number and free the GPU texture if needed. It did not do this for Cycles/Eevee image texture nodes in materials, only BI materials. That is easily solved, though for best playback performance it could be done in a smarter way than before. The main issue however is copy-on-write. Both the original and COW datablocks need to be updated. This could be done as part of the depsgraph now for image users that are in the depsgraph, marking such materials or objects as depending on time. Refreshing the GPU texture is problematic as well. Currently each image datablock stores and owns a single GPU texture at a single frame. However it is now possible to have multiple depsgraphs each at their own time. A proper solution to this likely means moving ownership of the GPU texture from the image to the image user or depsgraph, or having some kind of caching system. Brecht Van Lommel (brecht) added a subscriber: Makoto Fukushima (Pastel). Philipp Oeser (lichtwerk) merged a task: T60716: Image Sequence Feature that in Image Texture Node Not Working . Philipp Oeser (lichtwerk) added a subscriber: Ahmet (Quasar). Philipp Oeser (lichtwerk) merged a task: T60728: Eevee doesn't render sequenced textures. Philipp Oeser (lichtwerk) added subscribers: Chris Carroll (sirchced), William Reynish (billreynish). Emil Karas (esdw22) added a subscriber: Emil Karas (esdw22). And for some even more bazaar reason - it won't go past frame 97. I guess it's a memory problem? Tried the same scene with a few different videos in the same scene so far... but I might make this reporting bugs on a script rather than Blender if I'm not careful. I guess I'll be putting my greenscreen nodegroup for material nodes on hold. I just discovered that if you toggle the sidebar (N) in the image editor, it gives you options to change the amount of frames to use in a movie/image sequence. This seems to be unaffected by the settings on the image texture node. Still trying to figure out how to use more than one image sequence texture....any solutions? @Daniel Craven (Craven) , Yep. Brecht Van Lommel (brecht) added a subscriber: Albert (iSpeedy). Daniel Craven (Craven) - thankyou! I will be putting a tutorial together on this in the next week. When will the bug get fixed? @Philipp Oeser (lichtwerk) , i try to compile blender (da1da3053d75) with your solution, but your variant don't give needed result (black material with video texture and pink - with sequences). That give expected result (video and sequences update in viewport but render - sequences is flickering), but only when object is selected and active. riidom (riidom) added a subscriber: riidom (riidom). in all BKE_image update/check frame/etc uses cfra as integer. But in GPU_texture_from_blender used time in double. Ofcourse, in sequences/video textures logically to use integer (as frames). So, why using double? ogierm (ogierm) added a subscriber: ogierm (ogierm). This comment was removed by pistol ioan (pistoltoto). I would like to send some resources for this problem particularly to speed the process, is it possible? I support. Ready to transfer money for a speedy solution to the problem. Where to transfer? Thank you @Brecht Van Lommel (brecht) I'm broadcast tv director. We are designing a tv show with a real time dynamic CGenerated scenography. Because of Eevee Blender can be ideal for that. But the real time movie clip elements insertion\playback is obviously crucial. We need a lot of video contribution in scenography. Have you an idea of how much time will take the fix? Thank you so much. Yanis (Yanis) added a subscriber: Yanis (Yanis). Also very interested in this!! Now you can scrub the timeline and see the changes. I can donate $ 40. ... so, for this problem I think 1000$ is not enough. Sebastian Parborg (zeddb) added a subscriber: Stick (StickMeister125). Brecht Van Lommel (brecht) added a commit: rB0e3a2acbfa69: Fix T57457: animated image sequences not working in Eevee..
You were always my hero, right after you created Cycles! pistol ioan (pistoltoto) awarded a token. @Brecht Van Lommel (brecht) , I do not refuse my words, please tell me where to transfer money? @Vladimir (evilvoland): anyone is welcome to contribute to the development fund, this bugfix was funded by it. @Brecht Van Lommel (brecht) , I wanted to thank You personally, but the support of the whole team is also important. Thank you very much for the work! Thanks @Brecht Van Lommel (brecht) ! Is it functional in 2.8 - 6bab905c9d40 ? If so, it is only working with open node editor and active texture node - with properties. Is that right? I also have some troubles when doing opengl previews. I have a batchscript that starts Blender, replaces the background sequence, renders a opengl preview (because 10x faster than regular evee rendering) from different cameras and quit. The backgroundsequences can either be png-seqences or mp4 files and the script does the switching and setting offsets. But the rendering is very unreliable and often I end up with only 3 animated frames and then a freeze, or the background is not moving at all. When I open up the scene everything looks fine in the viewport and scrubbing the timeline works. I couldn't detect a pattern yet. If there are further specific issues with image sequences, please create new bug reports. But it is same problem as before ... If we created new report we will wait for enough people with same problem then it will be in progress, so it may be long time story. Same here, in my case it's not just freezing randomly and then play animation again but mp4 files get confused with each other on different planes meaning I've got 4 planes with 4 different mp4 files. One frame plane number 1 got texture number one but on the next frame the same plane has got texture number 2. Edit: if anyone's having same troubles with mixing sequences/clips with themselves make all of them single user data. Solved the problem for me. Its not freezing anymore as well. Please do create new bug report, this is working for many cases so if there is a bug it's related to some specific setup. And for that it is best to have an own report with .blend and clear steps to redo. It also means we don't send mails to 50+ people subscribed to this task for a bug that is not relevant to them. Its work but there is still a little bug on autorefresh command. 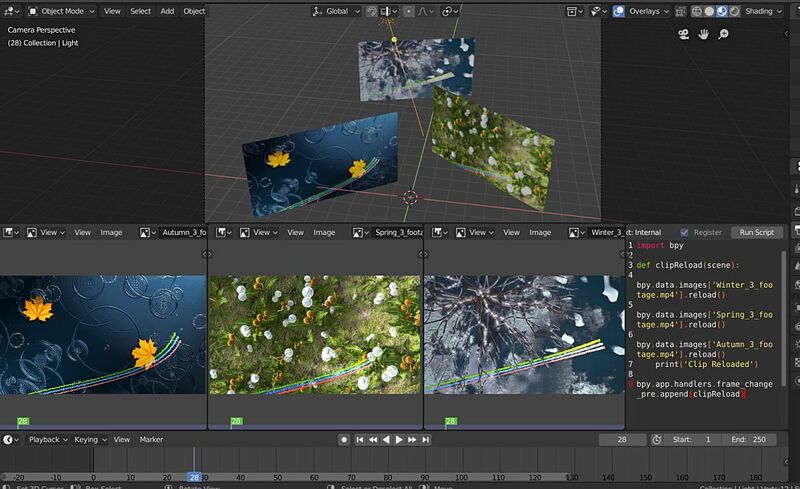 (on my system) Just reassign material you are working on to object in the shader editor when you finish your node assigning video texture etc (remember to set total frame number, activate cyclic and auto refresh) hit play and movie or image sequence work perfectly. If not video remain stopped to first frame. I noted with pleasure same video shader/material is shareable over undefined object number. Why do you have that driver setup in the offset? It's been confirmed and will be worked on, no need to discuss it here.